Create a legally binding Texas Bill of Sale with our attorney-drafted template! What Is a Texas Bill of Sale? A Texas Bill of Sale is legal proof that documents the sale of an item between private person or between a business and an individual. 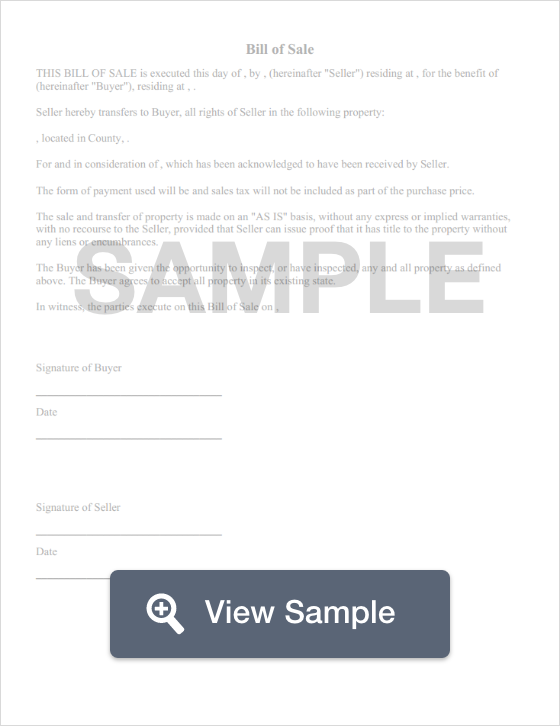 It contains information such as a description of the property being sold, the name of the buyer, the name of the seller, and the amount that was exchanged for the sale. Depending on how a Texas Bill of Sale will be used, you may need to have it notarized. It is also important to keep an extra copy of the document because you may need to permanently relinquish a copy to a state agency when you register the change in ownership. What Are Some Commonly Used Bills of Sale Used in Texas? The most commonly used Texas Bills of Sale used are for boats, motor vehicles (such as a car, truck, or motorcycle), and a gun. A general Texas Bill of Sale may also be used for items that are considered personal property, such as a computer or laptop. How Do I Write a Texas Bill of Sale? A Texas Bill of Sale should contain certain information related to the buyer, the seller, and the item. It should also list the county in which the sale occurred. The bill of sale should include the date and the purchase price. Finally, it should be signed by both parties. It can be written in plain English. The information required in the Texas Bill of Sale will depend on the item. For instance, if the Texas Bill of Sale for a motor vehicle would need to include the year, make, model, body style, and VIN. You would also want to include the driver's license number of the buyer. With a general Texas Bill of Sale, you'd want to include descriptive information related to the item. If it were a laptop, you'd want to include the make and model of the laptop as well as other identifying information. Although transferring certain types of personal property (like a computer or television) doesn't require the buyer to file a bill of sale with the state, it still acts as proof that the purchase occurred. 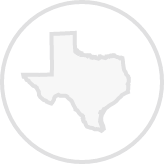 A Texas Bill of Sale is required to register a motor vehicle in the State of Texas. The requirements for this specific bill of sale include the seller's name, county of residence, and the selling price of the motor vehicle; the buyer's name and driver's license number; the year, make, model, and VIN of the vehicle; and the seller must sign and date the form in front of a notary public. You don't have to use language that is hard to understand. You can use plain English as long as you remember to include all of the required information listed above. Along with a Texas Bill of Sale, you'll also need Form VTR-40. This form is used to disclose the mileage of a vehicle. You'll also need to complete Form VTR-346 and submit within 30 days of the sale of the motor vehicle to TxDMV Vehicle Titles and Registration Division. Visit your county tax assessor's office to complete the registration process. You'll need to take an Application for Texas Certificate of Title, your Texas Bill of Sale, a certificate of motor vehicle inspection, proof of insurance, your driver's license or state ID, and an Application for Registration Purposes Only if there is a lien on the vehicle. You should also be ready to pay the registration fees in full. You can find the necessary forms through txdmv.gov. A Texas Bill of Sale is required to register a boat. The Texas Bill of Sale should include the name, physical address (including city and state), and driver's license numbers of both the buyer and the seller; the make, length, and year of the boat; the hull ID number; the registration ID number; the odometer reading; the title number; whether a trailer for the boat is included in the sale (if so, you must include the make and year of the trailer); whether an outboard motor is included with the sale (if so, you must include the make, year, and horsepower of the motor); the price of the boat (spelled out in words and then listed numerically); the agreed upon payment date; the date that bill of sale was created; a list of seller's disclosures (list any known defects); and it must be signed by the buyer, seller, and at least one witness in front of a notary public. How you register your boat in Texas will depend on whether the boat is new or used. Either way, make sure that you have extra copies of the Texas Bill of Sale. If your boat is new, you'll need a Texas Bill of Sale, a completed Vessel / Boat Application, and your registration fee in the form of a check or money order. Visit the Texas Parks & Wildlife webpage to ensure that you have the most up-to-date state forms and the most up-to-date fee information. If you're registering a used boat, you need a Texas Bill of Sale, a completed Vessel / Boat Application, a completed Verification of Vessel or Outboard Motor Serial Number, a completed Affidavit of Facts, and a check or money order for your registration fees. Visit the Texas Parks & Wildlife webpage to ensure that you have the most up-to-date state forms and the most up-to-date fee information. Keep in mind that when you register a boat, you must pay your registration fees with a check or money order. This is because Texas Parks & Wildlife do not accept credit card payments. Is a Bill of Sale Required to Register a Gun in Texas? No. Although guns aren't registered in the State of Texas, there are some requirements that a person or firearms dealer must follow to sell or buy a gun. A bill of sale is required is required. There are specific items that must be included in a Texas Bill of Sale for a gun. First, the buyer is required by law to read a statement that is at the beginning of the document to know whether they are legally allowed to buy or own a gun. If they are, they must print and sign this portion of the Texas Bill of Sale. The document must include the name, physical address, contact phone number, driver's license, and concealed weapon license number (if either party has a concealed license); the make, model, caliber, and serial number of the gun; the price of the gun; include the date of the sale; include any conditions of the sale (such as as-is or whether there is a warrant); and by signed by both the buyer and the seller. The buyer should review any conditional statement to understand whether the sale is "as-is" or to make sure that they understand the warranty included. However, if you wish to apply for a License to Carry, you would go through the process set forth by Texas Department of Safety's Handgun Licensing Program. To buy or sell a gun in Texas, you need a Texas Bill of Sale, complete the required background checks (if the parties are unlicensed), have a state license if you are a firearms dealer, limit the number of guns someone can purchase in a single visit, regulate what the state may consider unsafe handguns, allow the local government agencies to regulate guns, regulate the transfer or possession of any assault weapon, and regulate the transfer or possession of large capacity ammunition magazines. 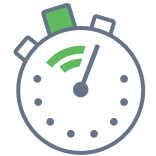 Create a free Texas Bill of Sale in minutes with our professional document builder.